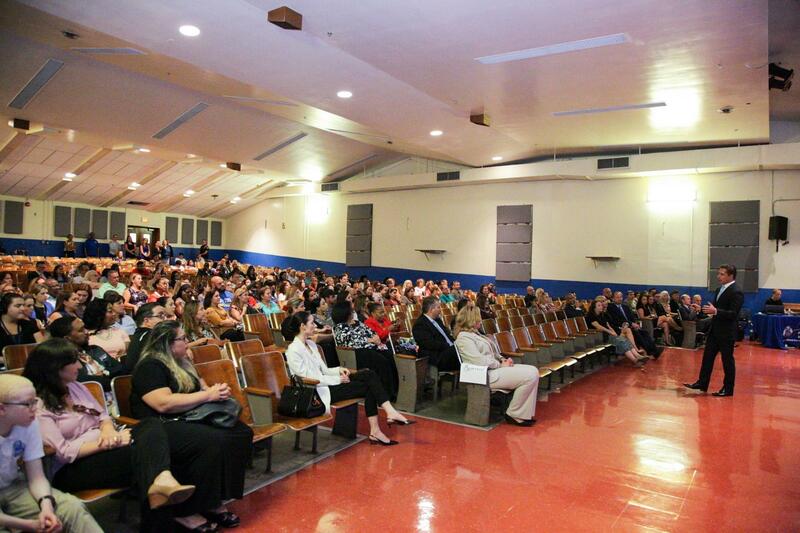 Miami-Dade County schools superintendent Alberto Carvalho presents during a town hall on the upcoming property tax referendum at Ponce de Leon Middle School in Coral Gables. South Florida school districts are planning their budgets for the next four years without a key piece of information: who will be the next governor. The superintendents of Miami-Dade and Palm Beach schools say the outcome of the competitive race could change their calculations about future tax increases and spending. State funding for schools could look very different depending on who wins the governor's race: Democrat Andrew Gillum or Republican Ron DeSantis. Local leaders are already considering how each scenario might affect the property tax increases they're asking voters to approve on the same ballot. "Whatever happens Nov. 6 in Tallahassee will dictate what happens moving forward with the referendum," said Palm Beach County schools superintendent Donald Fennoy. Palm Beach County schools is asking voters to approve a 1 mill increase in property taxes. That's $1 for every $1,000 in assessed property value. The district expects it to raise $150 million a year for four years to fund wage supplements for teachers, additional police officers and other priorities. Fennoy said a big increase in state education funding could lessen the need for local tax increases in the future. "If the budget looks better for us from the state, then we will we would strongly consider a different type of ask in the next four-year cycle," Fennoy said. Gillum has pledged a $1 billion investment in public schools. In Miami-Dade, voters will consider approving a 0.75 mill increase that would generate an estimated $232 million a year for four years to bankroll teacher pay raises and police officers. Superintendent Alberto Carvalho said, assuming the district's referendum No. 362 passes, the school board could adjust how much it plans to collect in taxes during each of the four years if economic conditions change. For example, the school board could collect less if lawmakers make a new investment in teacher salaries or school police officers. DeSantis has advocated for more school security. "Year after year, over the next four years — should we be so blessed to have 362 approved — we will make decisions in line with Tallahassee's decisions," Carvalho said. In interviews with WLRN, both Fennoy and Carvallho declined to offer their personal preference for governor — but encouraged their constituents to vote. Early voting starts on Monday.